Page revised in July 2015. The gardens round the town are beautiful; the trees were loaded with fruit; all kinds of vegetation seemed to be exuberant (..). Alternate breezes refresh the air in a remarkable manner (..). Upon the whole, it would be difficult to select a more charming spot for a city. Adalia I prefer to any Turkish town that I have yet visited; every house has its garden, and consequently the town has the appearance of a wood, and of what? orange, lemon, fig, vine, and mulberry, all cultivated with the artificial care of a town garden, and now in fresh spring beauty. In the last decades Antalya and its region (which is still known by its ancient name of Pamphylia) have become for European pensioners what Florida is for American ones. A very mild and sunny climate even in winter and a cost of living well below that of the Eurozone have attracted many retired people, especially from Germany, who have contributed to the economic growth of the area. Today Kaleici is almost entirely occupied by small hotels, restaurants, shops and hammams for tourists. 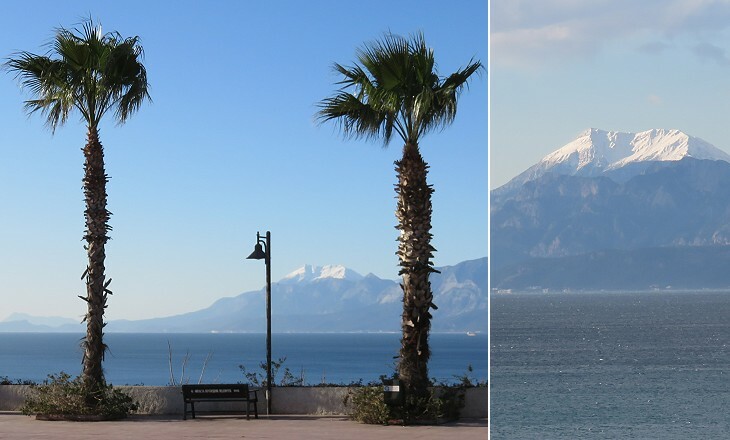 It has become a very minor portion of modern Antalya, which has a population of over 1,000,000 inhabitants. Pamphylia means "land of all tribes", an indication that it was populated by settlers of Greek origin as well as by clans coming from the Anatolian tableland. In 188 BC Attalus II acquired control over the region. Side, the main port in the eastern part of the region was far from his other possessions. He therefore founded Attalia or Attaleia at the westernmost point of the coast of Pamphylia. In 133 BC Attalus III, the last king of Pergamum bequeathed all his possessions, including Antalya, to the Romans. 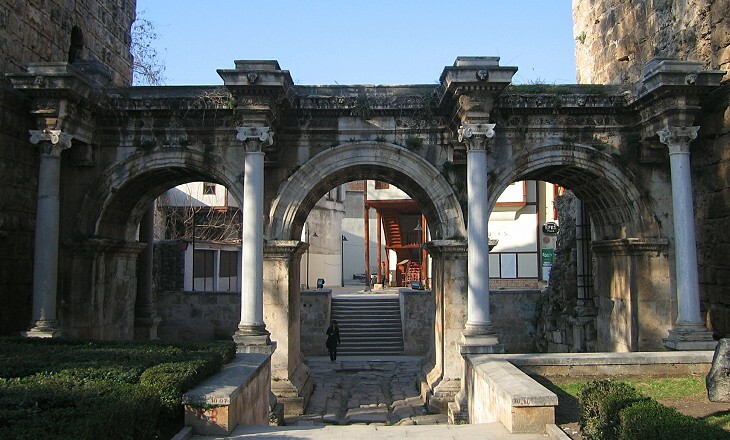 A triumphal arch was built in honour of Emperor Hadrian to celebrate his visit to Antalya in 130 AD. 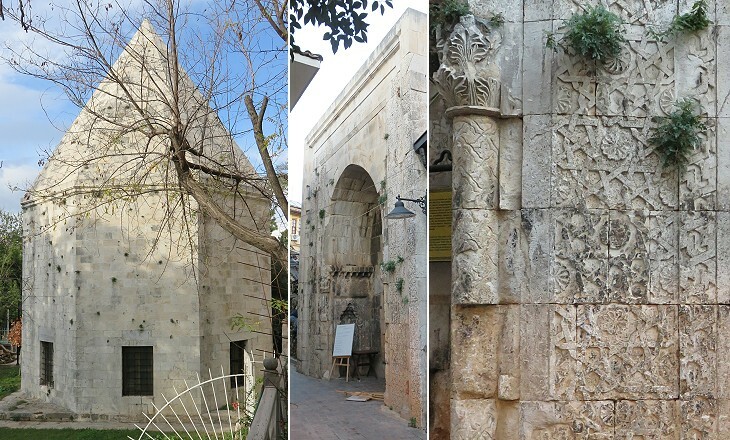 Later on the arch was incorporated into the city walls and became known as Uçkapilar (three gates). The access to the town was protected by two high towers and walls (now removed) were built above the arch. Hadrian dramatically increased government spending outside Italy. (..) Hadrian's travels all over the empire, although they made him unique among peacetime rulers, probably created burdens as well as benefits. Not all the public facilities bearing Hadrian's name were actually built with government money. Many of them were paid for by town councils or wealthy donors. The current monument is the result of a reconstruction made in the 1950s: the modern parts of the arch were built by using a stone which has a slightly different colour than the old one; the columns in front of the gate are new. 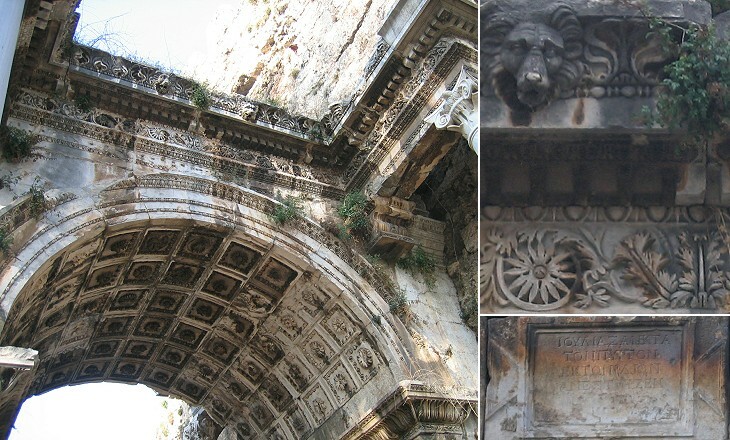 The northern arch is almost entirely original and it shows a very elaborate decoration, typical of the prevailing taste at the time of Hadrian. 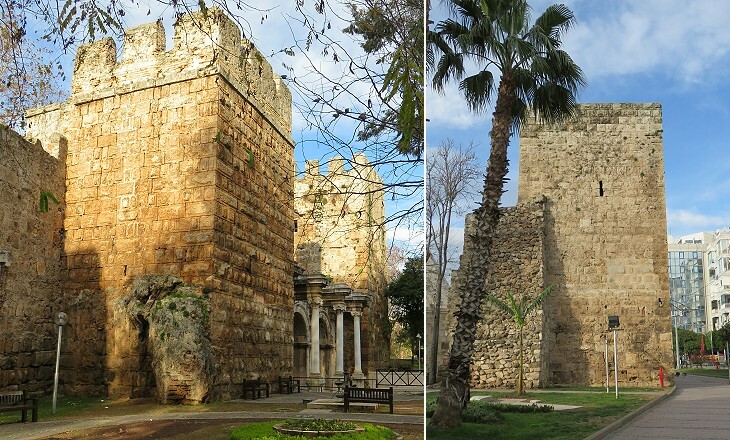 Antalya was protected by walls which were initially built at the time of its foundation. Those we see today are the result of a series of reconstructions/modifications which began in the late IIIrd century AD and ended in the late XVth century. The walls do not appear to have been redesigned to cope with cannon warfare, apart from some improvements made to those protecting the harbour. 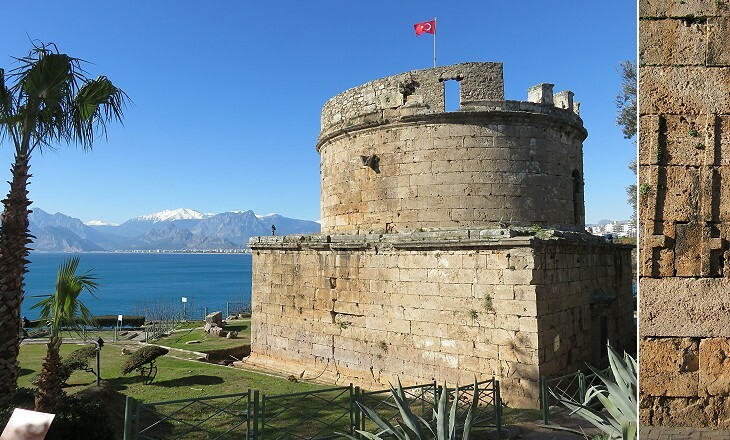 Originally Hidirlik Kulesi was the Roman lighthouse of Antalya: it was located on a cliff at the south of the harbour: it may have been built as a mausoleum. Near the entrance there is a decoration which could represent fasces, a symbol of authority in Ancient Rome. 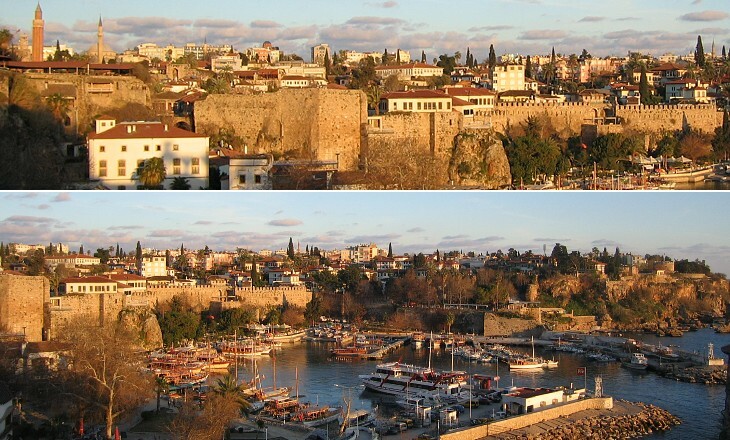 Hidirlik Kulesi was turned into a bastion from which cannon could hit enemy ships trying to approach the harbour, most likely after 1472 when the Venetians raided the town. 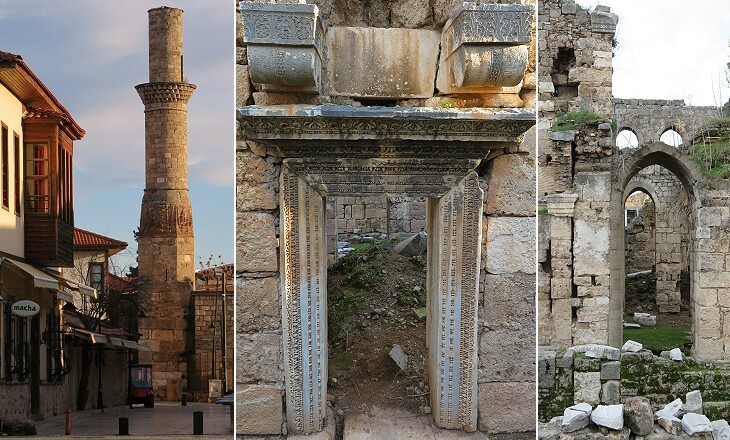 The church/mosque, which today is called Kesik Minare after its truncated minaret, provides a summary of Antalya's history. It was built in the Vth century as a church dedicated to Mary: columns and lintels from a Roman temple were used in its construction. 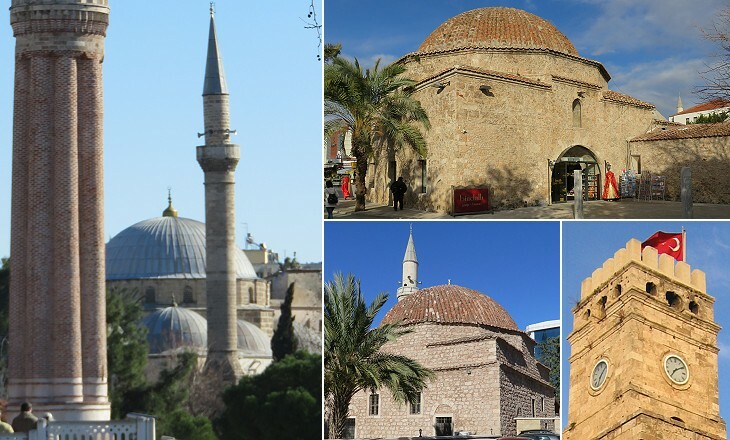 In 1085, when the town was occupied by the Seljuks, the church was turned into a mosque. The building returned to be a church when Antalya became an important Christian base supporting the Crusaders en route to the Levant. The Seljuks reconquered it in the early XIIIth century, but in 1361 Peter I, King of Cyprus seized the town and the building was again turned into a church for a short period. The mosque was damaged by fire in the XIXth century and it was not rebuilt. Yivli Minaret stands on the highest point of the land walls and it was built by Sultan Kaykhusraw I soon after conquering the town. It was at the same time a symbol that Antalya had become a Muslim possession and an excellent observation point to detect early any enemies arriving by land or by sea. 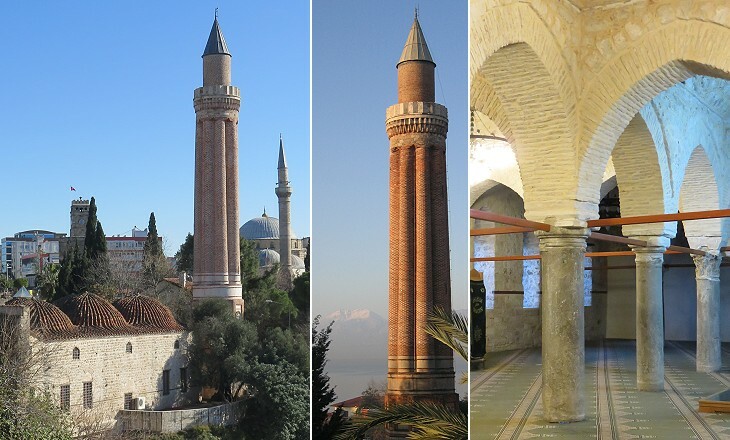 Fluted minarets can be seen in many towns which were part of the Seljuk Sultanate of Rum (e.g. Sivas). 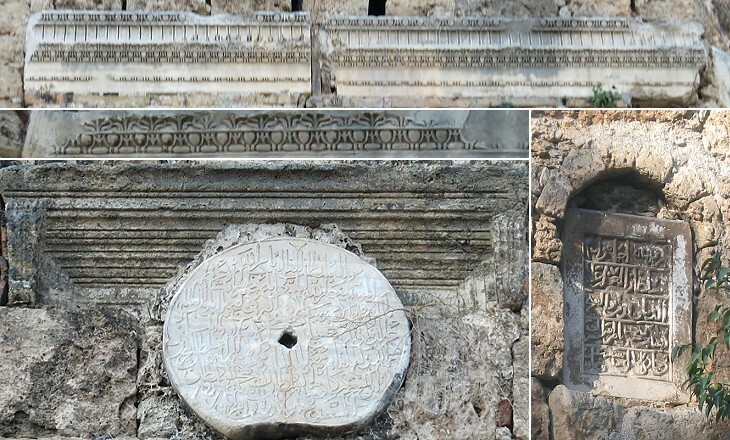 It is not unusual to find Islamic inscriptions in the form of a medallion on the walls of towns in the Levant (e.g. Damascus). 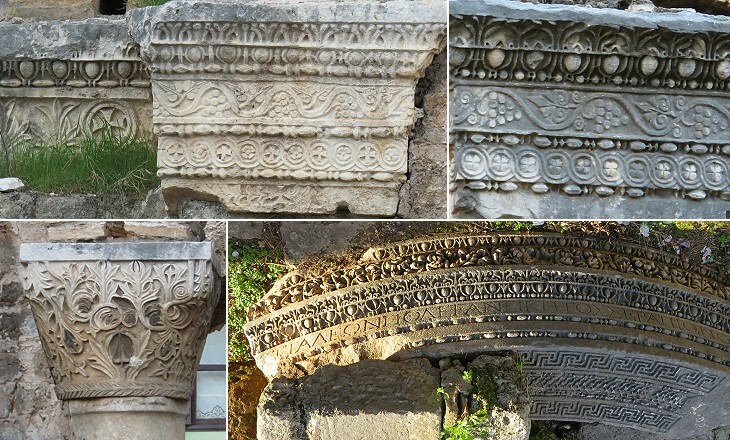 They were made by cutting broken columns into slices which were then carved (as can be seen at the Archaeological Museum of Antalya - it opens in another window). Other inscriptions were written on the back of ancient gravestones. 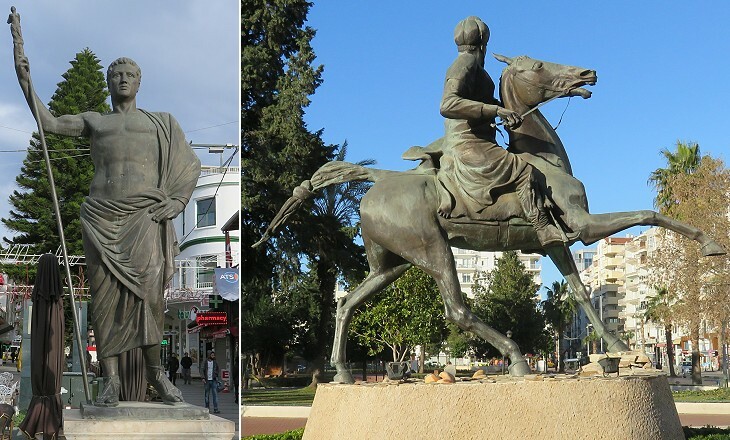 In the XVth century Antalya became an Ottoman possession, but its mainly Seljuk character was not modified by major additions. You may wish to see Antalya in a 1700 etching by Cornelis de Bruyn (it opens in another window). At that time it was known as Sattalia in Europe. The image used as background for this page shows a detail of Yivli Minaret. 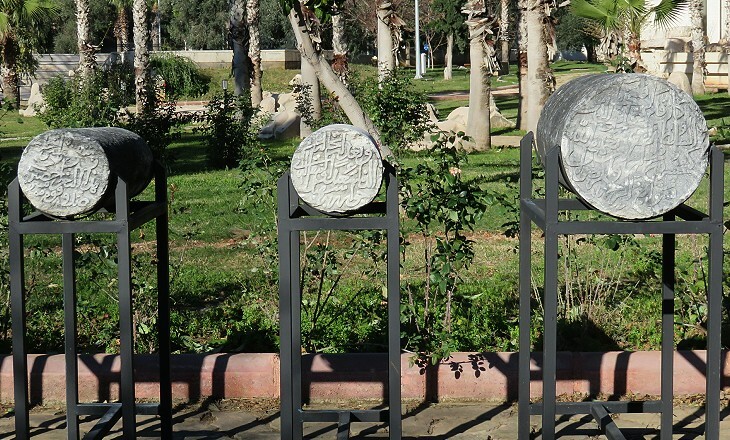 Move to the Archaeological Museum of Antalya.